My first impressions of Havana were of peace and tranquility, almost as if time had stopped in the mid-twentieth century. 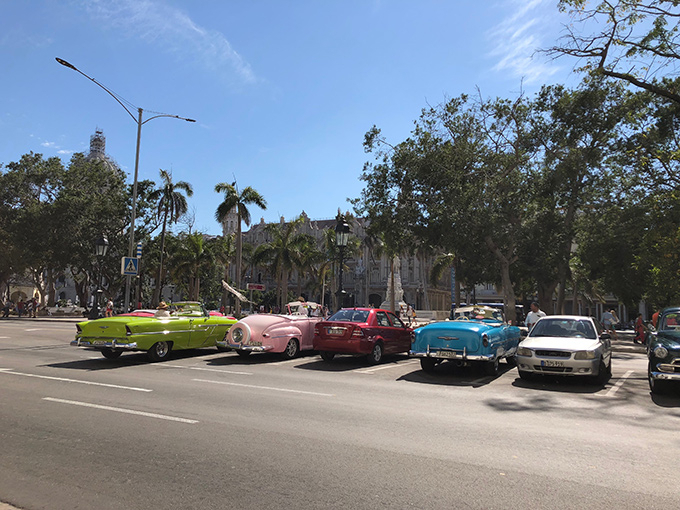 The Old Havana area in Cuba's capital is a magnet for Western sightseers, and has many classic American cars that were imported in the 1950s before the country's relations with the United States soured. Repaired over and over to keep them running, the cars are a wonderful match for the colonial-style architecture painted in pinks and greens. The area has plenty of music, too, with the son and rumba reverberating from ubiquitous street-corner cafes and restaurants. Classic cars imported from America in the 1950s still run in Old Havana. 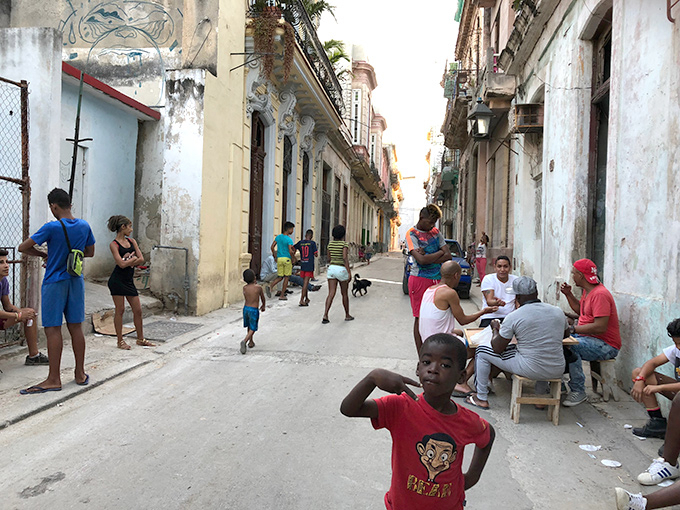 Stepping into a small side street in Vedado, the New Havana, provided a glimpse at part of the everyday lives of the warm and friendly locals and the free-ranging dogs and cats. For Cuban nationals, medical care and education are virtually free, and a rationing system ensures that no-one goes hungry. Many people could be considered poor in economic or material terms, but there is apparently no extreme poverty. There are still no major wealth or income inequalities, and that is perhaps one of the reasons why Havana's streets are safe, enabling you to walk around without having to stress about potential crime. Internet access is limited, so you are not constantly interrupted by e-mail or social media. Spending a carefree time enjoying simple pleasures reminded me of life in Showa-Era Tokyo. Stepping into a small side street in Vedado takes you into the everyday lives of warm and friendly locals. In celebration of the 120th anniversary of the arrival of the first Japanese immigrants to Cuba, the Japan Foundation, Wifredo Lam Contemporary Art Center, and the Embassy of Japan in Cuba jointly presented a contemporary art exhibition from March to April 2018. Entitled "Going Away Closer: Japan-Cuba Contemporary Art Exhibition," the exhibition brought together artists active in present-day Japan and Cuba. Exhibition spaces at Wifredo Lam Contemporary Art Center are arranged around the central patio. 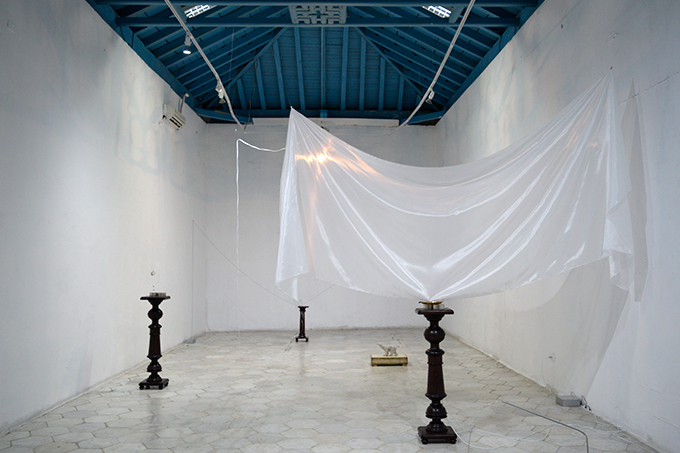 Wifredo Lam Contemporary Art Center in Havana provided the venue, and the theme for the exhibition was based on the concept of distance. Considering the sense of distance that emerges from the similarities and differences between characteristics of Japanese and Cuban culture and society, the artists explored the issue of closeness or distance as associated with all sorts of different things and phenomena. 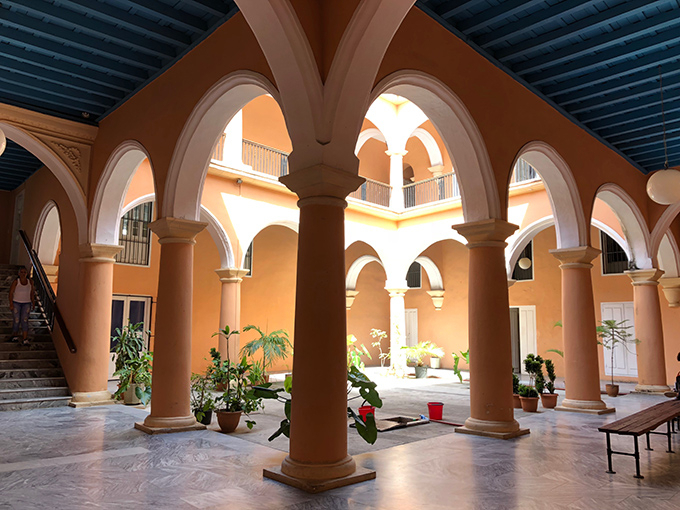 The works that emerged from this exploratory process were presented in the Wifredo Lam Center's beautiful Spanish colonial building with a central patio surrounded by cloister-like corridors. The exhibition spaces are arranged around the patio, with mosaic tile floors and arched openings providing an exquisite backdrop for the exhibits. For Painting of Japan - The small basin universe - (2013-2014), Natsunosuke Mise used sumi ink and shell-based gofun pigment to paint Japanese scenery and Cuban flag motifs onto scraps of washi paper tied together with koyori paper cord, hanging the resulting paintings from the ceiling like national flags. Concealed fragments of stars, moons, and other motifs are scattered throughout the paintings, and light passes through the gaps between paper. The scene strongly resembles that of a boat with ragged sails made from scraps of fabric patched together, and the work as a whole conveys an image of small island nations, Japan and Cuba, bobbing on the sea in remote parts of a world that is centered on the West. Yuko Mohri's polar-oid(o) (2018) is a live installation that uses magnetism, gravity, and other invisible and non-uniform forces that exist in the environment around us to synchronize the movements of an assemblage of readymade objects collected in Cuba and precision equipment brought from Japan. The meticulous detail generated a dynamism that surpasses the scale of the actual matter, and offered a new context in which to consider the culture of everyday Cuban life that overcomes chronic shortages of supplies by looking after and carefully re-using old items. Takahiro Iwasaki exhibited an installation with Tectonic Model (Allegories) (2018) and a number of other works dotted around the floor like a group of islands. 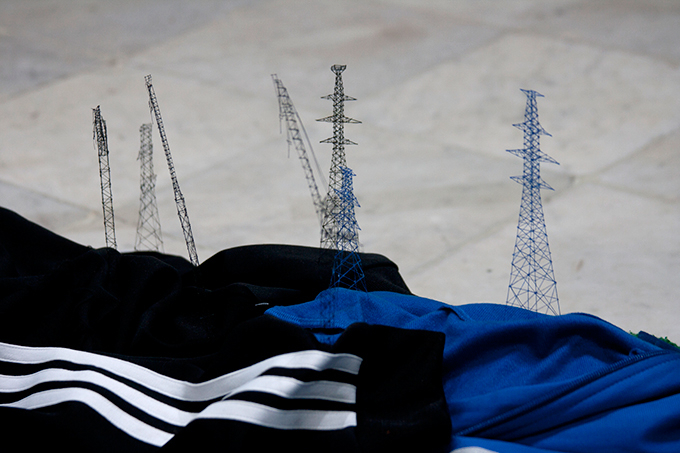 Iwasaki's finely-detailed works involve constructing models of cranes or towers using fibers unraveled from page-markers attached to the spines of books, or from clothing or towels. Irrespective of where they are installed, the works reward viewers who focus their attention on them by asserting a powerful presence. In Cuba, as in Japan, his works stir the focal point of viewers, making peripheral visual perceptions blur, and in this way the artist's work explores the limitations of human beings who are swayed by focused viewing and overviewing, of both the present and the past. Glenda León's Air from Tokyo (2017) was in the same room as Iwasaki's installation. 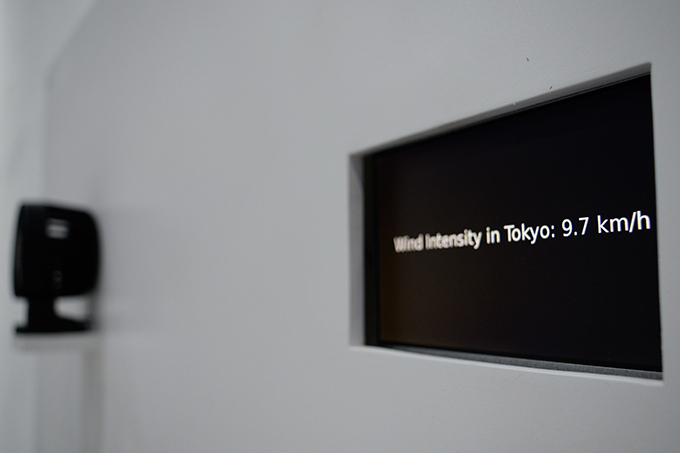 A small electric fan sent out a gentle breeze, installed alongside a little monitor that displayed the current wind intensity in Tokyo. On seeing Iwasaki's fragile and stoic works that looked as though they would be broken by a gust of wind, León, curious about a land she had never visited, wondered how strong the wind is in Tokyo. That gave her the idea of interpreting distance as wind strength. León is one of Cuba's best known artists, and has a reputation for poetic conceptual art. I was invited to her studio in a residential area in the newer part of Havana, and was delighted to be shown a large number of minimal works executed neatly using familiar materials such as cassette tapes and false eyelashes. Each addressed contradictions from society or delicate aspects of the human condition, continually communicating the issues in ironical whispers. Reynier Leyva Novo's Untitled (military and civilians) (2018)** is a hand-woven rug made of scraps of fabric or old clothing, of a type that can be seen worldwide. Look closer and you discover that the chaotic material mixes colorful clothing and everyday fabrics with textiles in military colors. The work gives an impression of the dominance of olive khaki. Novo focuses on Cuban history and meticulously researches his subject, producing works that make viewers imagine events long forgotten in history, or everyday situations that are too close to be able to see clearly. 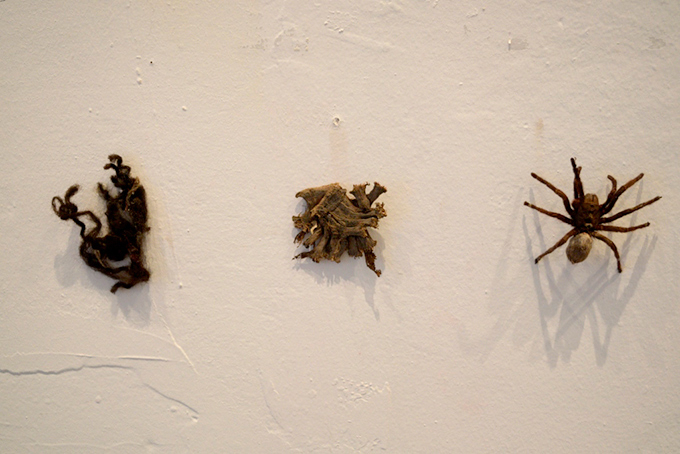 In From the series Verses and Theorems (2009), José Manuel Mesías also uses found objects as his material, including small familiar items and animal corpses. Juxtaposing two objects--a lobster and brush, horse stirrup and bird bone, or a twig and cigar--he turns his intense gaze to similarities of shape and texture in what could be considered contemporary Cuban analogy. Discerning a variety of distances between the "souls" of the various objects, he attempts to examine the meaning, in anthropological terms, of sophistication and progress. The dexterity with which Mesías and other Cuban artists make use of manufactured or discarded objects clearly attests to an origin that does not derive from the "readymade" concept of Marcel Duchamp that plays a large part in the history of contemporary art, particularly Western contemporary art. After the revolution, the significance of objects to the Cuban people became completely different from their significance to people in the West, where objects became symbols of the consumer society. When everyday objects are constantly in short supply, recycling becomes a means of survival, not a laudable lifestyle choice. Consequently, in Cuba, objects themselves provide a historical narrative that stretches from the recent past into the near future. They are the Cuban reality, and are capable of conveying extremely fine nuances. That was one of the key things I learned from conversations with local people, including interpreters and local people of Japanese origin as well as artists and people associated with art, during my visit to one of the world's few socialist countries. Futoshi Miyagi exhibited one of his best-known recent works, A romantic composition (2015). Miyagi comes from a small island in Okinawa, but has since worked in New York, and is now based in Tokyo. This work interweaves a number of video sequences that blend fact and fiction, presenting two perspectives: that of an American serviceman at a U.S. military base in Okinawa, and that of an Okinawan man, a pianist. Miyagi acknowledges the influence of Cuban-born contemporary artist Félix González-Torres who lived in New York before dying of AIDS. Miyagi's work consistently interprets differences or gaps not as breaks that remove hope, but as sources of possibility. This video installation is a true gem, revealing possibilities for society as a whole in the sharing of culture, a "behind-the-scenes globalism" that has long been actively enjoyed by the gay community. Leandro Feal's Life already changed (2017) used a nostalgic CRT television to screen "Cuban Lover" (La Novia de Cuba/"Kyuba no Koibito"). Directed by Kazuo Kuroki and featuring Masahiko Tsugawa, this was made to mark the 10th anniversary of the Cuban revolution in 1969, half a century before Futoshi Miyagi's love story, and is the only movie to have been produced as a joint project between Japan and Cuba. 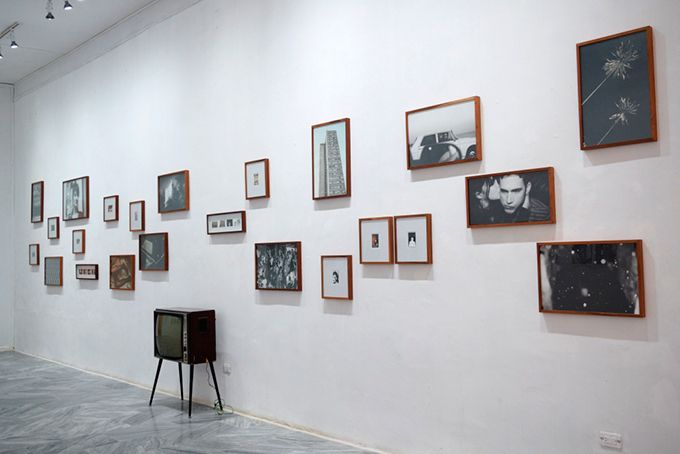 On the venue walls, Feal arranged snapshots of the ordinary lives of young people in Cuba. These photographs covered the period from pre-revolutionary times to the present day, but were mixed together without dates being identified. Pictures that match stereotypical Japanese and American images of Cuba overlap with scenes that are changing with the policy shift from socialist revolution to deregulation. The past, present, and future come together to form a coherent image of youth, updating viewers' memories. Opposite Feal's installation was Tokyo: Third contact (2018) by Kazutomo Tashiro. This is a sequel to Tashiro's series of over 1,200 individuals photographed during Tashiro's repeated visits to the Tohoku area of Japan following the earthquake and related disasters in 2011. The new series consists of photographs of people he met in Tokyo, taken on the street in ordinary residential areas or shopping streets. For some reason, the subjects are neither self-conscious nor smiling. Instead, they stare steadily at the camera. Pointing your camera at an unknown other. Having an unknown other point a camera at you. The spread of smartphones means that irrespective of literacy, ordinary people are familiar with both stances. In these photographs, antagonism can be felt from both sides of the lens despite the fact that both gazes are suppressing the brutal stress of Tokyo. Incidentally, while in Havana, I never once felt the tension that is such a familiar feature of Tokyo. 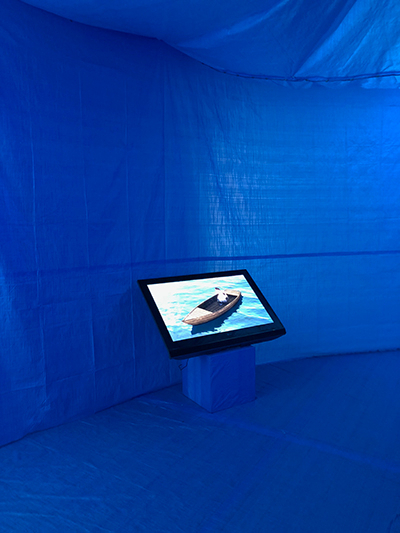 In Tadasu Takamine's The Unwelcomed - Cuba Version (2018), a video shows a small boat bobbing vulnerably on what is clearly a blue tarpaulin sea, under a round ceiling-light moon. Talking with the local curators, Takamine learned that during and after the revolution, large numbers of Cubans - by some estimates as many as several hundred thousands - perished in attempts to reach America in simple handmade or makeshift boats. Takamine had already created a work of the same name after many wooden boats from North Korea washed up on the Japanese coast last year. This conversation led him to realize that the connection to wrecked boats was one of the things shared by Japan and Cuba, and inspired him to reconfigure his work so that it related to the two island nations, the continents they face, and their distance from the American superpower. The book that is the last item in his installation was positioned so that viewers could see the cover from both inside (via a mirror) and outside the building. There was a clear reaction every time a viewer discovered that the book was Virgilio Pinera's legendary anthology La isla en peso ("The weight of the island"), which had been banned in Cuba. The only outdoor work was Atsuko Mochida's Further you go, you may fall or you may learn (2018). Mochida installs temporary structures such as walls and stairs on the boundaries between private and public in the built environment, and the incongruity of her interventions shakes perceptions of the meanings and qualities of such spaces. 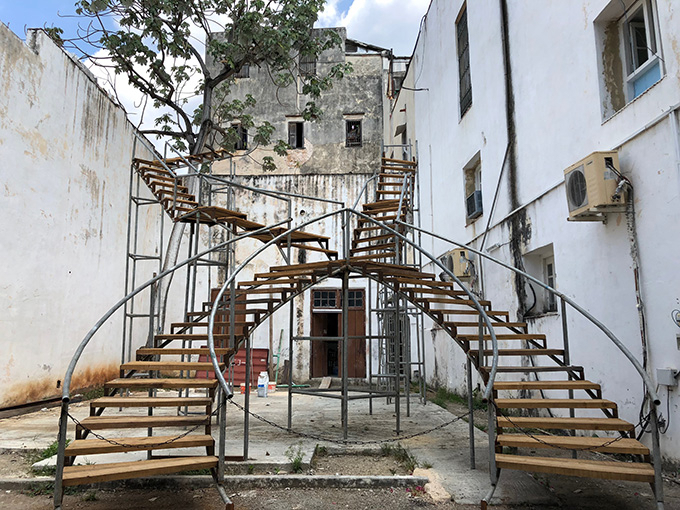 In the venue's back garden, Mochida suddenly produced spiral staircases assembled from steel pipes, metamorphosing a half-forgotten patch of land into a nonsensical and spectacular space to create a different world with a fragile balance. Abel González Fernández, local independent curator and one of the curatorial team explained: "We started with the concept of 'distance' proposed by the Japan curator team after their field research, and this enabled the Cuba side curators and artists to each express their individual thinking and stance. That was innovative. My objective was to destroy the conventional image of Cuban society and culture." In contrast, the Wifredo Lam Contemporary Art Center's curator Blanca Victoria López commented that "both countries were able to bring together young members for this project, and both were each able to gain an appreciation of the differences between us in terms of both society and art. That was what enabled us to work out ways of obtaining all sorts of materials for use in producing the works to be exhibited. The idea of a cultural exchange exhibition sounds simple enough, but the actual processes involved in producing the exhibition were quite difficult at times." The processes that she refers to are mainly related to gathering materials and to communication or liaison. In Cuba, internet access is under government control, and the infrastructure is reminiscent of Japan in about the 1990s. Free public WiFi is only available in hotel lobbies, parks, and a few public facilities, so the only option is to buy WiFi cards in one-hour units (routers can't be brought into the country), and you have to be aware that your communications are subject to monitoring and censorship. In particular, sending and receiving large images or other large amounts of data is extremely difficult. "But things are much better than they were. Before we had WiFi in the museum, we sometimes had to work in the park until late into the night," she laughed. Nevertheless, she was obviously frustrated by the situation. This exhibition benefited from both the approach to a different culture taken by familiar Japanese artists, and the historical perspectives and issue awareness of Cuba's most dynamic artists. In circumstances where choice of materials was even more difficult than expected, the artists of the two countries were able to successfully deploy their richly diverse and sophisticated creativity, and the curatorial team displayed amazing resourcefulness and artistic sense. At the same time, this exhibition made clear why it is that Cuba is attracting so much interest at the moment. Both the art and the glimpse that it afforded of the culture inherent in Cuban society and life produced an "adult" culture shock in someone who has seen both sides of the Western-centered postwar world. 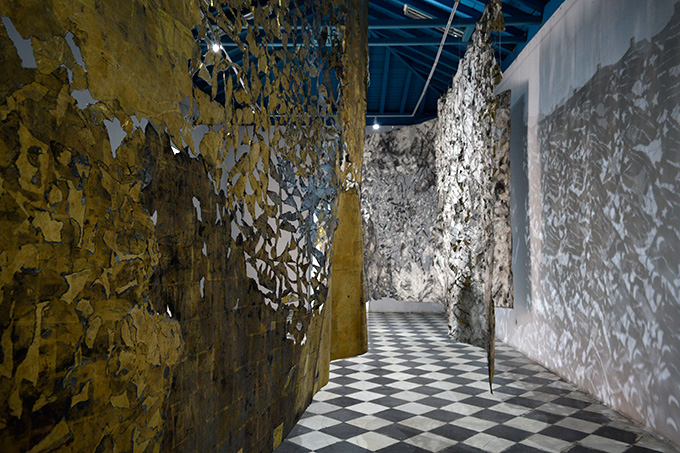 That shock was engendered by both the differences between the Japanese and Cuban systems, and the exhibition theme that was intimately connected with "distance." Even after returning to Japan, I find myself still thinking about what is the essence of the peace that is such an indispensable part of our lives. 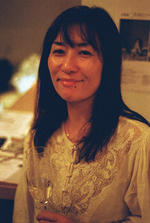 Sumiyoshi is an art producer and writer. She graduated from Keio University, Faculty of Letters, Department of Aesthetics and Science of Arts. She has been working as an art journalist since the 1990s. She organized the alternative space TRAUMARIS (2003-15). Currently she is engaged in producing contemporary art exhibitions and performing arts in various places. She also serves as a director of RealTokyo, an online culture review site which was revived in 2018.